A song to play while you’re reading about the Orioles: “Baltimore,” by Randy Newman. I was tempted to use Nina Simone’s version, but Randy’s is just so good. Newman is a dark comedy genius, however, this song depicts a dying city in the late 1970s and is missing the comedic lyrics you hear in some of his other work. There is a deep uneasiness and sense of despair that permeates throughout the song. Deindustrialization crippled the city, and the song is a reflection of the economy and neighborhoods struggling to survive. Last year, perhaps by luck or some twisted form of fate, I decided to journal about Manny Machado’s last season as an Oriole. I was hoping it would go one way, had suspected that it would go a different direction, and really wanted Adam Jones to sign an extension. Not because it would make on the field sense, but because he was good for the city of Baltimore, and the world could use more Adam Joneses. Here are some random entries from a journal that got real dark pretty damn quick. 2018 was a tough year for Orioles fans. While the next few years will not include many wins, the team is hopefully maybe perhaps on the right track. One thing is for certain, I do not plan on journaling the 2019 season. What is the Orioles’ most recent accomplishment? I sat listening to singer Phoebe Bridgers for a solid 15 minutes while trying to think of a recent Orioles accomplishment. Adam Jones had just signed with the Diamondbacks, officially ending any chance of a reunion with the O’s, and signaling a true end to a pretty fun era. The struggle to find anything positive or any accomplishment at all was daunting. So, to cheer myself up I opened Twitter. Luckily, I saw a report about bullpen cameras and I realized that their most recent accomplishment took place over the offseason and likely immediately made a positive impact. Their biggest accomplishment of the past year is hiring Mike Elias and, subsequently, Sig Mejdal. Whether it is the Edgertronic cameras that are now lining their bullpen, or their Minor League pitching coordinator, Chris Holt, holding mandatory spin axis seminars on the back fields, this is a team that is finally on the analytics train. Zack Britton offered this little nugget into his experience with analytics to David Laurila of Fangraphs: “It’s (targeted) to each individual player. I don’t want to get into specifics, but some of it is how my ball moves, both my sinker and my slider, compared to different hitters’ swings. It kind of opens your eyes to things you maybe didn’t think of when you didn’t have that information.” Since this quote, the Orioles have increased the size of their analytics department fivefold. Mejdal received 700 resumes for two analyst positions and 500 for developer roles with the organization. While it’s not signing Bryce Harper or former Oriole Manny Machado, I’d say this is a pretty huge accomplishment. 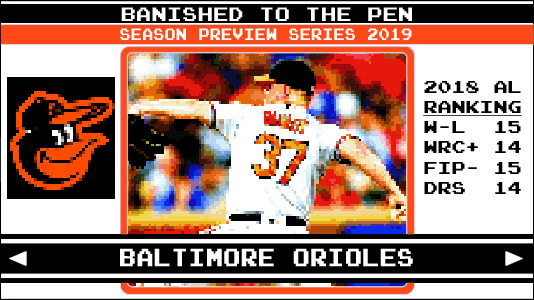 How will the Orioles define success in 2019? If the Orioles can get three months of good pitching from one or two of Cashner, Cobb, and Bundy, they will have some trade candidates. Otherwise, the season will only be a success if the likes of Austin Hays, Cedric Mullins, Ryan Mountcastle, DL Hall, Yusniel Diaz, Dean Kremer, Ryan McKenna, Keegan Akin, all show positive growth during the season. I love this guy! He struck out a whopping 3.7 per 9 in 2017 across 63 innings! Bleier gets ground balls, gets out of jams, and stops rallies. Richard Bleier is good, and if the baseball gods want this Orioles fan to have anything good this season, he will continue to be good. I cannot think of any pitcher that is more Effectively Wild(ier) than this guy. The 2019 Orioles are going to have to give fans a lot of reasons to come to the park. Most of those reasons won’t be to see the team win or to see great players. With Schoop, Machado, and Jones all gone, there are not a lot of options for bobblehead giveaways. One of the better promotions this upcoming season is a baseball movie night at OPACY. The May 11 game against the Angels will be followed with a showing of A League Of Their Own. The first 20,000 fans 15 and over will receive a “There’s No Crying in Baseball” t-shirt, and there will be ticket packages that will allow fans to watch the movie from the field. Oh, you can also pick yourself up a Rockford Peaches hat at the game.